I’m generally shooting in RAW so the images need some form of post processing. Consider that out of camera JPGs are just images that have been processed by the camera as you can make adjustments to contrast, saturation, white balance etc on camera. But shooting in RAW provides more versatility in creating the final image. Also in images – I may process it more to the feel rather than an being an accurate representation of the location. Each image will generally be different and the process flow is evolving constantly. For example at the moment I’m playing around with orton diffusion and luminosity masks – and these will feature more in my flow as is appropriate. Remembering that this is just an example of what I may do. Each image will have differing visualisations and needs. Also everyones styles evolve differently and what I like doesn’t necessarily match whatever anyone else likes. This is the image – where I can, will capture the image a little bit to the right without over blowing the highlights. My camera shows me the “blinky’s” where it’s over exposed. The reason for this is that trying to recover shadows is much noisier than darkening them. If the sky is too bright – I may use either a graduated ND filter, black carding or consider bracketing the image for either HDR or luminosity masking purposes later on. 4 Scrutinise and fix any dust spots – I sometimes create a curves layer and push it to some extremes to highlight the dust. 5 Mask the land to sky using Topaz remask – this is such an easy way to mask. I usually harden the mask a little bit and check to see if the masking is applied the way I want and adjust as needed. Topaz remask is an amazing product that makes it so quick and easy to create effective masks in Photoshop. I separate into sky and land because some of the land processing isn’t how I like the sky – eg may make it more contrasty than I’d like. 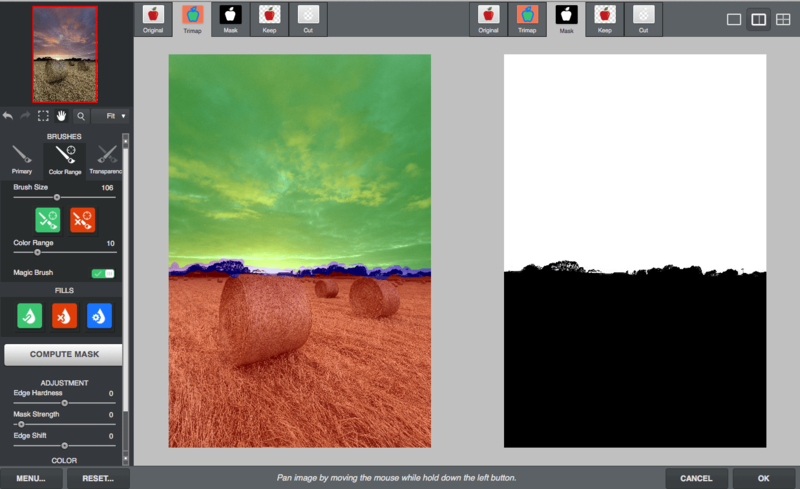 6 Create two groups for sky and land – copy the mask for the sky to one, copy paste and invert the mask to the land and then delete the duplicated layer for remask. I do this to minimise the file size so it’s mainly adjustment layers and masks. 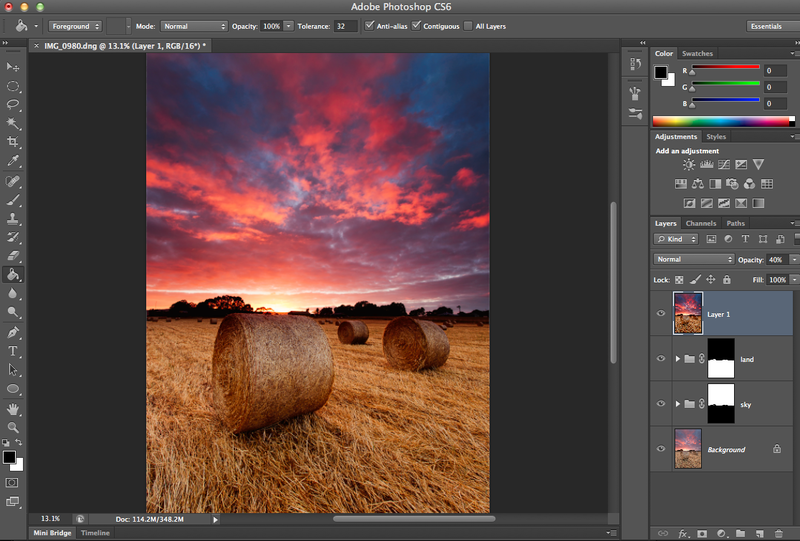 7 Create curves and colour balance adjustment layers for each of the sky/land groups. Curves maybe just a slight S curve or by using the pointer to bring up and down a light/dark point. I’ll have to confess in this instance I did a larger sort of S – just liking the stronger effect. Usually the differences between the sky and land aren’t all that great, but enough for me to want to separate them. 8 In this particular instance I created a layer and attach to the land group and ran a high pass filter for sharpening. 9 I may create another layer then and merge the visible layers (without deleting them) – and then run topaz adjust. I like pop quite a lot – but either will tone it down or shift the opacity to 40-50%. Usually I don’t like topaz adjust pop much on the sky – if this is the case I’ll shift this layer to the land group. Topaz adjust pop if run by itself makes some saturation and contrast adjustments to the image – and I’d rather tone down especially the contrast part on the sky to keep it more natural. When I started using topaz adjust pop – I loved it – but as time has gone by, I’ve been toning down the effect more and more – I prefer to have it as a subtle adjustment. 11 Bring the image back into lightroom. I might make some minor additional tweaks at this point such as moving the highlights back and some vignetting. 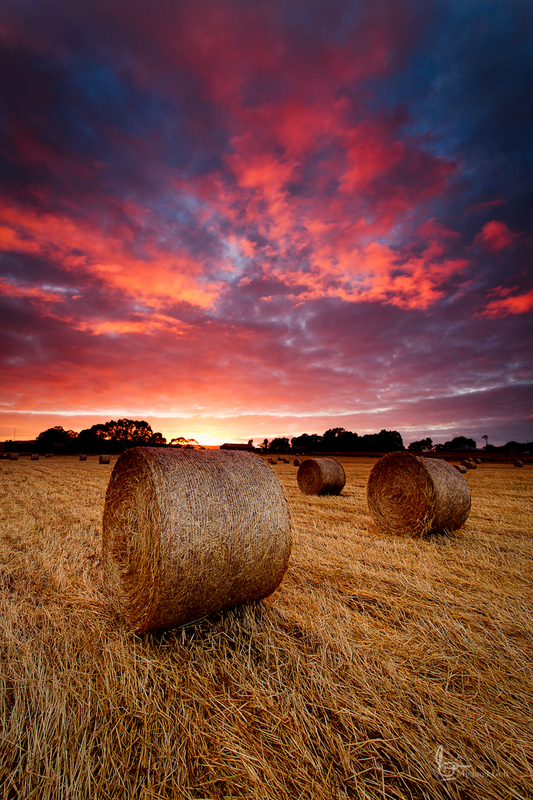 In this particular image I used a slight vignette and also used an adjustment brush to slightly darken the base of the curve of the hay bales. Most of the saturation will come from a combination of doing the curves and the reduced opacity topaz adjust level. Most of the time I don’t do dodge and burning (here I did as described under step 11 above). If I do – it’s with a 50% grey adjustment layer. Most of the time I’m not changing the blend modes for the layers – but I encourage you to play around with the different modes to understand the different effects. While it looks like a lot at the moment – I’m actually reducing how much I actually do now. Apart from panorama stitching – the process nowadays only seems to take about 5-15 minutes for most images. I use a Wacom Bamboo tablet to assist with my post processing. I find the intuitiveness of using a pen feels so natural now. It took awhile to get used to and I probably wouldn’t use it if I wasn’t using photoshop. I use a 24″ IPS monitor with reasonably good colour space and use a Spyder4pro for colour calibration. Most of my images till recently have been edited using just a 13″ macbook pro monitor. you’re writing about “black carding”, thats a new term for me, what is it/how du you use it? I think I should probably make a blog post about it – it’s using a black piece of card to cover the brighter portion of the exposure (such as the sky) to reduce the exposure on that component. Only really possible with long exposures, although I’ve done it with a 1s exposure before.